See what our volunteers and field staff have been working on during the past month. We completed our second round of 2017 small-scale experimental eelgrass transplanting in July, in collaboration with Cal Poly and California Sea Grant. In total, we planted seventeen one-meter by one-meter plots of eelgrass including nine in the forebay (across from the Tidelands boat launch) and eight in the midbay (across from Morro Bay Oyster Company). Though our midbay location was not as successful as the forebay site, we were able to glean useful information from these efforts, including which areas to target and which to avoid for future plantings, as well as helpful staking methods to keep the eelgrass anchored. With the help of two early morning boat rides from Morro Bay Oyster Company, we checked on these plots during some very early-morning negative tides. One of the forebay plots. 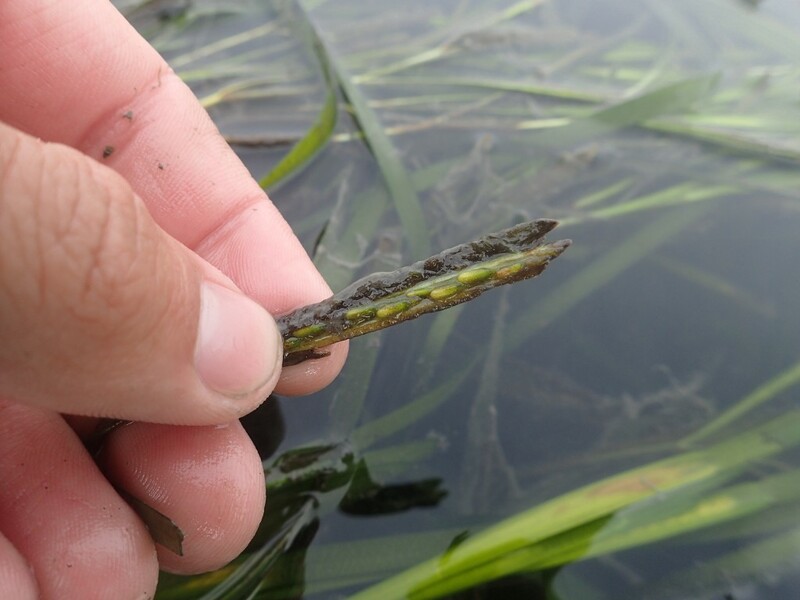 Bulla snails have already found these plots and laid eggs on the eelgrass blades. Though the eggs are very gooey, we don’t believe they are harming the eelgrass. Though 5 a.m. might not be everyone’s favorite time to start work, it is a great time to spot wildlife. 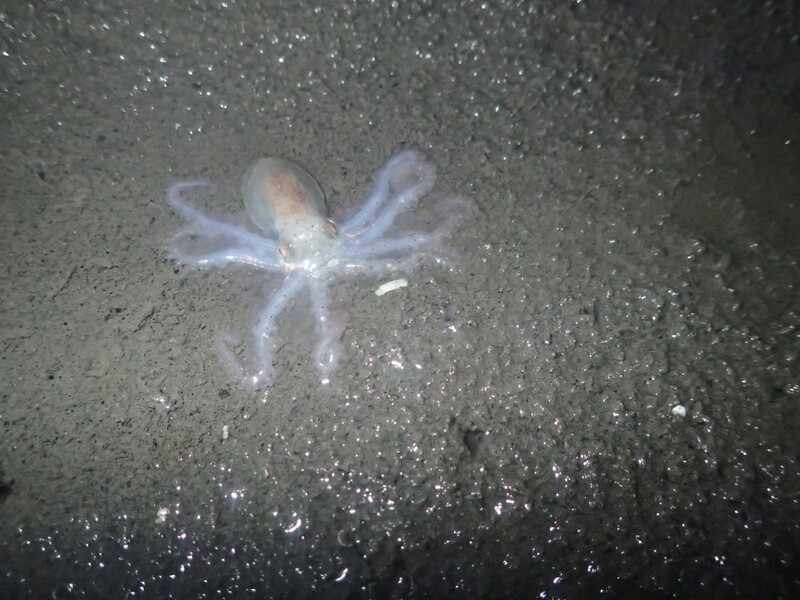 Along with a few nudibranchs, we found a juvenile octopus in a depression in the mudflat near the eelgrass plots. Cal Poly and Estuary Program staff will continue to monitor the eelgrass at these locations and will use this data to inform future restoration efforts. 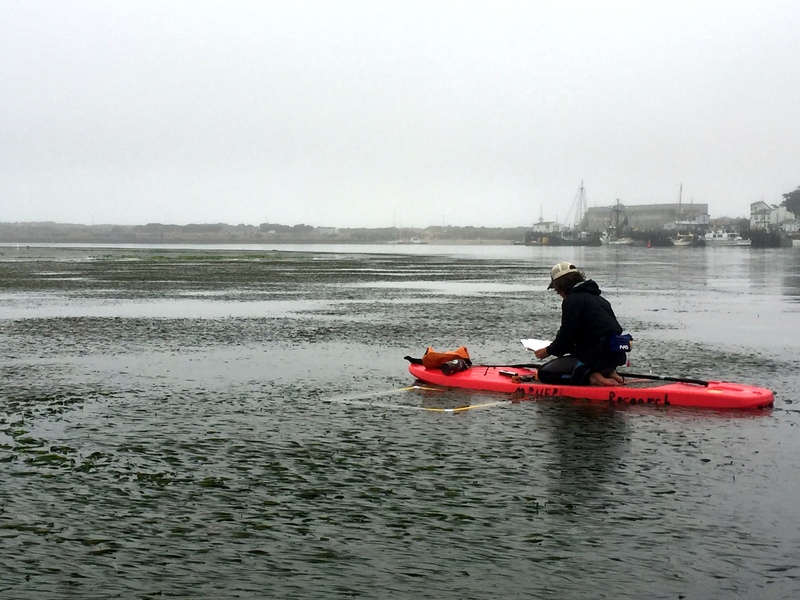 In the meantime, we are continuing to monitor existing eelgrass beds to learn more about the eelgrass flowering and seeding patterns in Morro Bay so that we can plant eelgrass seeds during future restoration efforts. 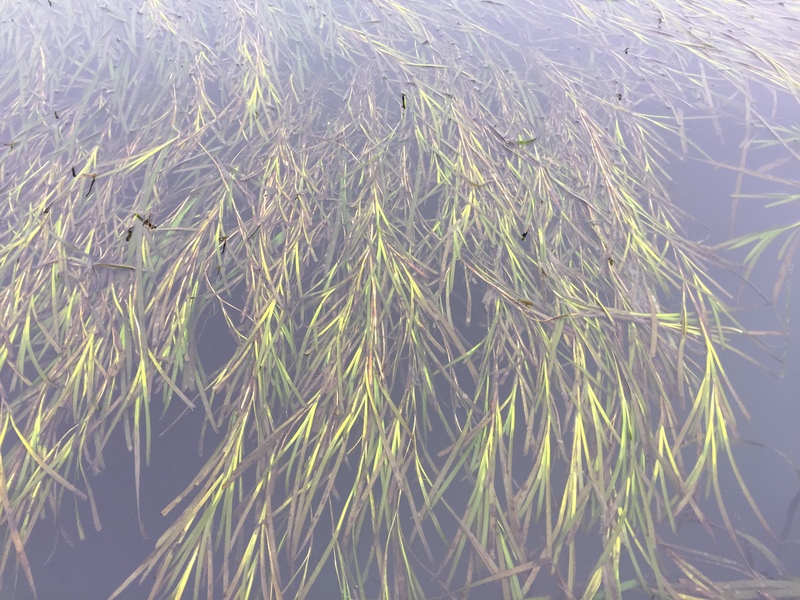 The lighter green blades in this photograph are flowering eelgrass shoots. Eelgrass has six stages of seed development. Like terrestrial plants, you don’t want to collect seeds too early, or they might not germinate. Fun fact: Did you know that seagrasses have the longest pollen grains on the planet? Matt, our Field Technician, works to identify and count the stages of the flowering shoots in a one-meter by one-meter plot. Our goal is to harvest blades once the seeds have reached the fourth stage. We will hold the blades in a mesh bag off the dock until the seeds are fully mature and ready to plant. Then we will put them in small burlap sacks, place them in a few different locations around the bay, and monitor them to see if they will germinate. Though seeds have a lower success rate than transplanting, this process has a minimal impact on the donor bed. The seeds on this blade are reaching maturity. Eelgrass blades can break pretty easily at this stage. Some fish, invertebrates and birds also forage on eelgrass seeds. 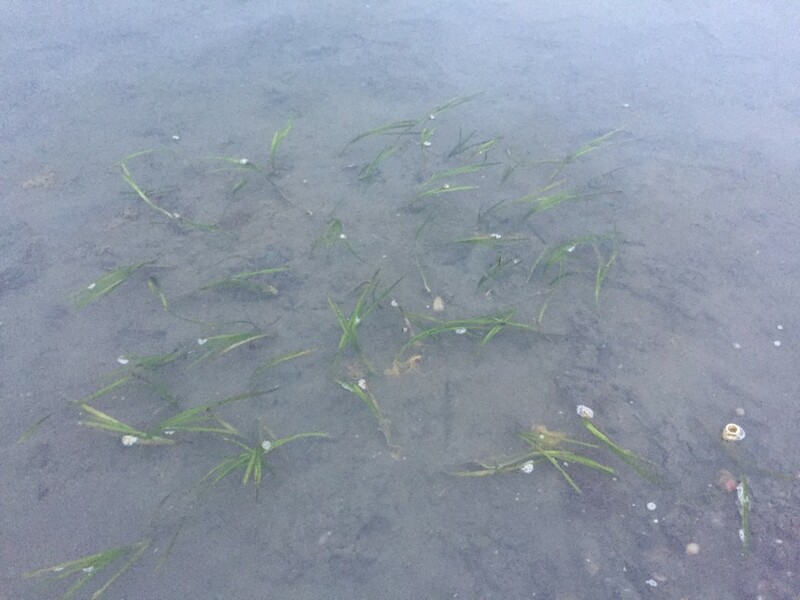 Eelgrass seeds are negatively buoyant, meaning they usually sink pretty quickly. Blades breaking off or animals grazing on the seeds can actually aid in dispersal of the seeds. So far, we are learning that the eelgrass beds in Morro Bay flower and advance to the different stages at varying rates. Based on what we have seen in the last few weeks, we should be able to start collecting seeds in September. 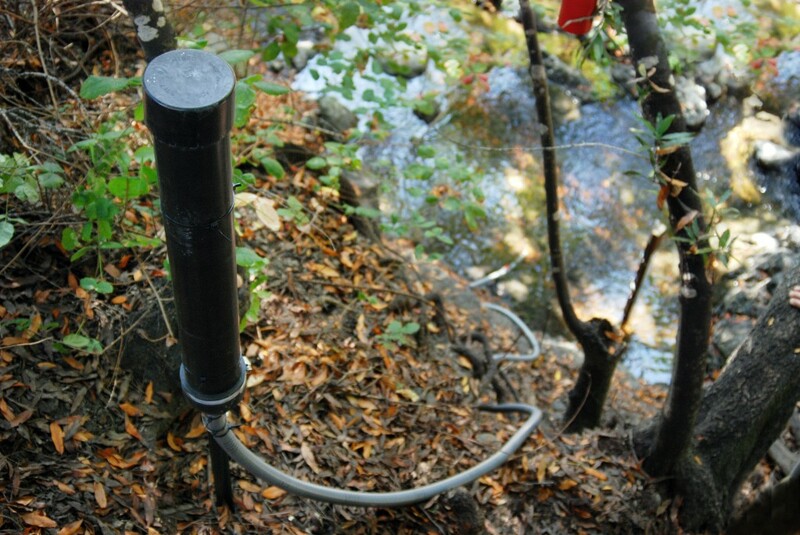 This winter, we had to remove one of our pressure transducers on Pennington Creek. The equipment was buried when a creek bank collapsed. We were able to retrieve it and then reinstalled it this month, hopefully in what is a more stable location. A pressure transducer consists of a data logger on one end of a cable that continuously measures depth. This end is installed in the water. Installation is especially exacting and tedious because if the equipment moves even a centimeter after installation, our data will not be accurate. 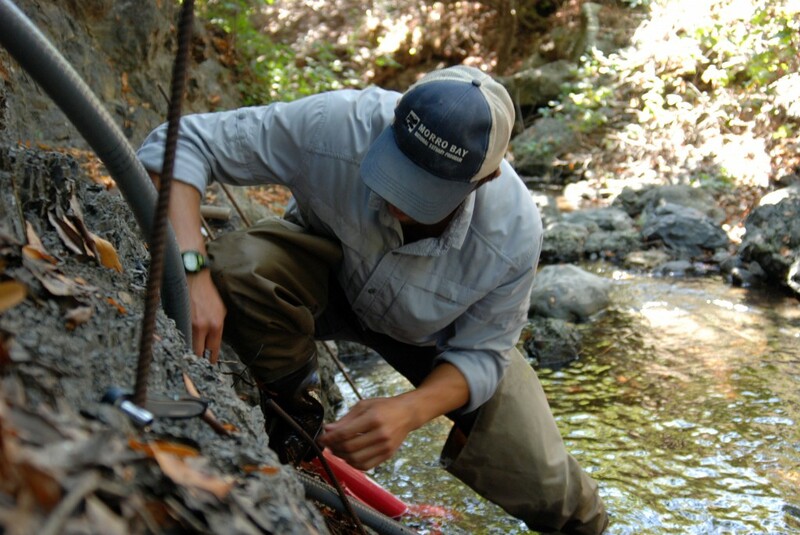 Shane utilizes the stream bank to anchor the end of the pressure transducer. The pressure transducer is fed through piping to help protect it. The other end is placed in a secure location up on the stream bank, where staff will be able to access it year-round. We can connect this end to a computer to download the data without moving the sensor in the water.